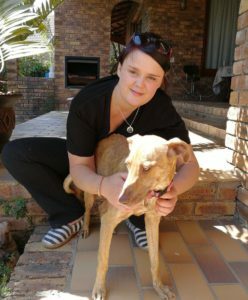 Home » Shelter News » Well done Ashleigh! We would like to thank Ashleigh, left, who has fostered Amber AND her many puppies for 5 weeks. What a difference a loving home can make. Amber is now fit and well and the proud mother of strong, healthy puppies. Visit the puppies here! 4Paws Animal Shelter thanks you Ashleigh! Please contact Tammy if you are willing and able to foster any of our pets.